Paula Marvin’s creativity knows no bounds. 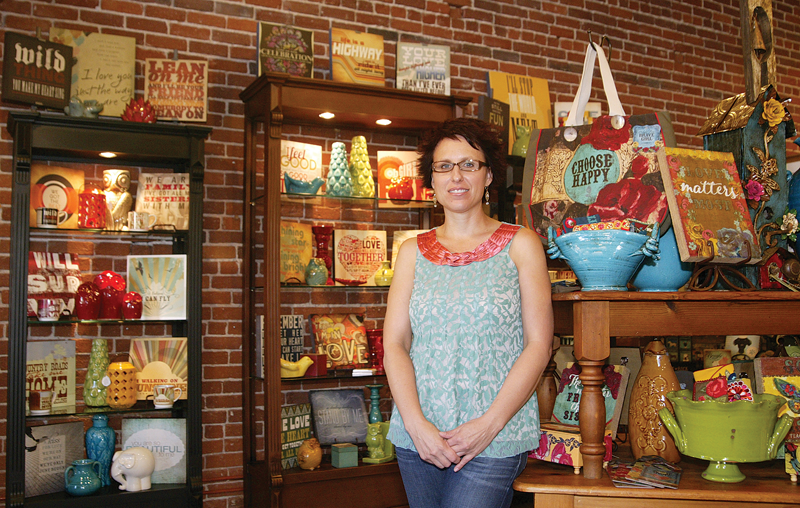 Since opening her own retail store behind the picturesque Wildflower Café in Exeter in 1999, Marvin has found the most unique ways to decorate every nook and cranny of her store. But after 15 years, she knew it was time to swirl the paint brush on her retail palette and remake a new masterpiece of merchandise at Rosemary And Thyme. But for that, Marvin would need a new canvas. “I’m always trying to come up with new ways to display these wonderful things, but there wasn’t enough space to give them all the attention they deserve,” she said. After years of waiting, planning and decorating inside her head, Marvin finally found a second home for her displays earlier this year. On July 8, Marvin opened a second location on Pine Street. Exposed brick walls, double the space and smaller sections each with their own theme provided the blank canvas for Marvin’s imagination to splash across the new store. Marvin said the new, 3,200 square foot location is double the size of her original store and has a higher visibility for visitors from Exeter’s main street. She was able to use the new space to spread out her clothing and accessories and make way for more home décor and garden. Vera Bradley bags and handbags hang above shelves, Brave Girls Club gifts personalized with inspirational messages complement her fall displays, including creative and colorful home decor by Kelly Ray Roberts. Marvin said the constant flow of new items and changing displays keeps people coming in just to see how she has redecorated. She has also started offering Wish Lists for women, or more accurately, for the men who buy gifts for women. Marvin said women can come into the store, make a Wish List from items sold in the store. When a daughter, son or husband comes in to buy a gift for mom, they can choose from a list of things they know she will like. A back door was opened to the public to allow customers to use both locations more readily across the garden-like area between the two stores. Rosemary And Thyme’s original store is located at 121 ½ S. E St. and the new Home And Boutique store is located at 236 E. Pine St. in Exeter. For more information, call owner Paula Marvin at 59-592-3698 or visit www.rosemaryandthyme.com/ or Like them on Facebook.